It should be no surprise to investors that earnings estimates for both Q1 2019 and full year 2019 have been cratering. 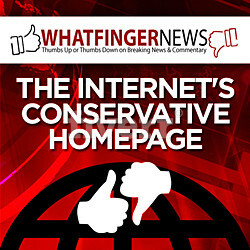 We have been discussing this story for a few months in our articles. 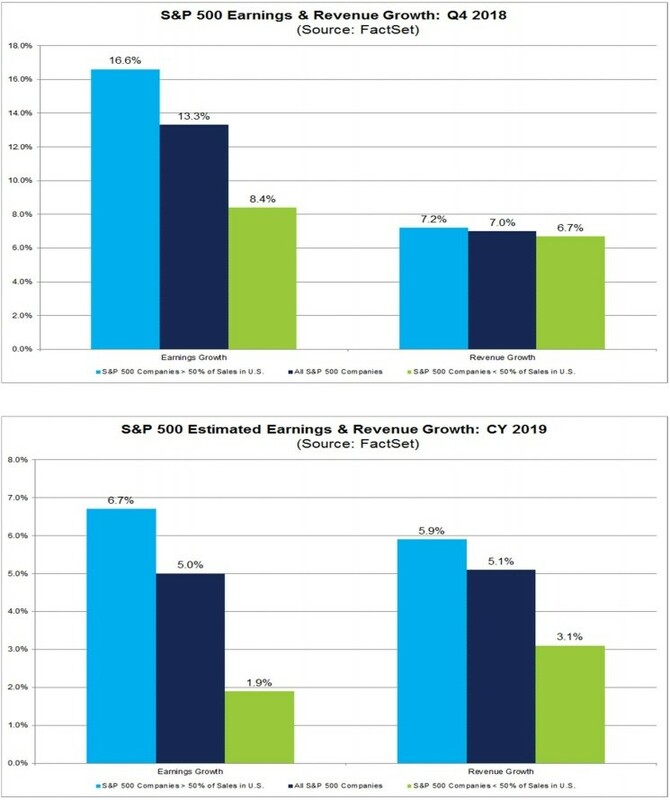 The latest estimate from FactSet is Q1 2019 earnings will fall 1.7% year over year and full year 2019 earnings will rise 5%. The good news is Q1 estimates will likely be beat. The bad news is they still have room to fall before earnings season starts. Q4 earnings season hasn’t even ended yet. Q1 2019 earnings estimates are unusual in the sense that tech is the laggard as its earnings are expected to fall 9.7%, while utilities is the only sector with positive earnings revisions as growth estimates increased from 4.6% at the end of last year to 5.2% today. Tech has the largest percentage of profits that come from foreign countries while utilities are domestically oriented. The American economy is on solid footing while Europe is slowing quickly and some of its nations are nearing a recession. Chinese growth is continuing to decelerate which is hurting many tech firms such as Apple. Usually international firms have quicker EPS growth than domestic firms, but that’s unlikely to occur this year based on current estimates. As you can see from the top chart below, firms with more than half of their revenues in America had 16.6% earnings growth and 7.2% revenue growth in Q4 2018. That’s compared to 8.4% EPS growth and 6.7% revenue growth for firms with more than half of their sales coming from abroad. The situation is similar for full year 2019 estimates. Firms that are domestically focused are expected to have 6.7% EPS growth and 5.9% revenue growth. Internationally focused firms are expected to have only 1.9% EPS growth and 3.1% revenue growth. If there is an earnings recession, it will be caused by international economic weakness. Currently, 37% of S&P 500 revenues come from international markets and 63% come from the US. If you want more American exposure, look at small caps. Part of the reason earnings are probably going to fall in Q1 is because of the extremely tough estimates. The tax cut boosted EPS growth in 2018 which created a large peak and the current valley in earnings growth in 2019. Revenue growth gives us an idea of how firms would be doing without the tax cut. In full year 2018, revenue growth was 8.9%. In full year 2019, revenue growth is expected to be 5.1%. Full year 2019 revenue estimates still have a long time to be adjusted before the results come out. That’s why it’s best to look at Q1’s results. 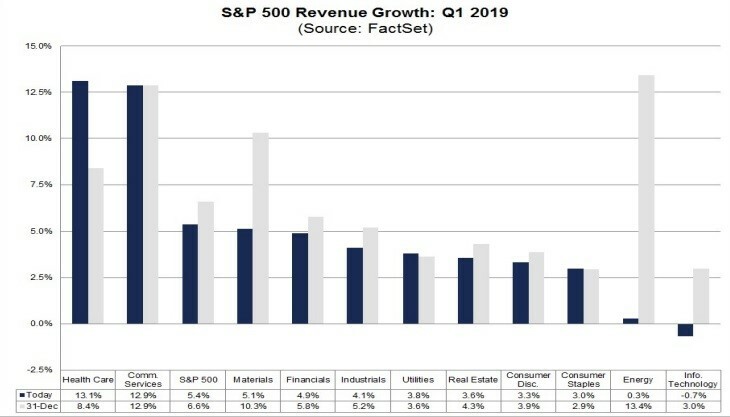 As you can see from the chart below, Q1 revenue growth is expected to be 5.4% even though EPS is expected to fall 1.7%. Only 4 sectors are expected to have earnings growth, while 10 out of 11 sectors are expected to have revenue growth. The energy sector is facing the toughest earnings growth comparisons which is partially why energy EPS is expected to fall 8.6%. Energy revenues are expected to grow 0.3%. So far, this potential earnings recession doesn’t look as bad as the one from 2014 to 2016. Stocks fell more when pricing in this weakness than they did during the corrections in that period. The US economy is outperforming the global developed world. Furthermore, there are some green shoots that suggest US economic growth may recover. As you can see from the chart below, the ECRI leading index’s yearly growth rate has improved from -4.3% to -4%. The comparisons are going to get easier in the next few months which suggests the possibility that this index could have positive growth soon. That implies a re-acceleration in GDP growth could occur in late 2019 or early 2020. Economic growth could be led by the housing market as prices have started to become more affordable as price growth has slowed and mortgage rates have fallen. The global economy is slowing. The Oxford Economics global risk survey charts support this thesis. As the chart on the left shows, about 70% of respondents stated the probability of sharp slowing in global growth has increased in the past 3 months. Furthermore, the chart on the right shows most respondents stated risks are slightly to the downside in the next 2 years. The good news is the percentage of respondents saying risks are heavily weighted to the downside has decreased modestly. The economic surprise index measures how economic reports look compared to the consensus, not the rate of change in growth. However, in Europe’s case the negative surprise index correlates with its growth decline. The European economy is in disarray. As you can see, its surprise index is by far the worst out of the four. Both America’s and Japan’s indexes are positive. In December, Germany’s industrial production fell 3.9%, France’s fell 1.4%, Italy’s fell 5.5%, and Spain’s fell 6.2%. Those are all year over year stats; only France’s beat estimates. To be clear, France is far from doing well. In the past 12 months, estimates for its 2019 consumption growth fell from 1.8% to 1.3% and estimates for its export growth fell from 4% to 2.3%. As you can see from the table below, European GDP growth is expected to fall from 1.8% to 1% in 2019. Ireland’s growth will fall from 6.2% to 3.3% and Italy won’t have growth. 6 out of the 10 countries listed above will grow less than their potential. Unfortunately, Portugal, Ireland, and Greece are small nations, while Germany, Italy, and France are large ones. China’s state-run media stated Q1 GDP growth could be 6%. That’s below Q4’s rate of 6.4%. It also stated 2019 growth could be 6.3%. As you can see from the chart below, retail sales growth for the Chinese New Year was 8.5% in 2019. That’s way below the 10.2% growth rate last year. It’s the weakest growth rate since at least 2011. European economic growth might slow to 1% in 2019 and Chinese growth could fall to 6% in Q1 2019. Both are sharp slowdowns. America is only experiencing a modest slowdown which is why S&P 500 earnings and sales growth will be much higher for domestically oriented firms than internationally oriented firms in 2019. The ECRI leading index suggests it might forecast a turnaround soon.